Most competitive gamers (including me) now prefer wireless gaming mouse as their reliable companion for their favorite games! 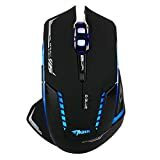 So, I decided to share my thoughts and recommendations on the best wireless gaming mouse that you can buy in 2019. Along with that, there are some really cool tips that can help you improve your game with a wireless gaming mouse. 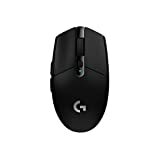 While it’s debatable that whether a wireless mouse is good for gaming, there are some clear advantages of wireless gaming mouse over a regular wired mouse when it comes to freedom of movement and the range of usage. I will explain all that in details but first let’s take a look the list of the best wireless gaming mouse that you can buy in 2019. Following are the best wireless gaming mice having practically zero lag that every gamer should consider buying in 2019. The Logitech G903 Lightspeed is just like the ninja warrior of wireless gaming mice. It has got all the features you will imagine and even more! Beginning from the design part, the ambidextrous shape feels super comfortable under my hand. It is sculpted perfectly for right-handed gamers as well as lefties, all you need to do is remove the thumb buttons as per the hand orientation. Though I prefer a claw grip, the unique shape of G903 is made in such a way that it works perfectly for any grip style. Logitech G903 comes with 11 customizable buttons and metal scroll wheel. The click mechanism is improvised and the clicks sound a lot better than most of the wireless gaming mouse on this list. Accuracy is also not an issue as Logitech has put its most reliable PMW3366 optical sensor with 200 – 12,000 DPI range. The single click DPI button is precisely positioned to tweak the motion on the fly. Lightspeed wireless technology ensures zero latency with response time as low as 2ms. No other wireless mouse has impressed me this much with their latency. Despite having this many buttons, metal scroll, and the battery, the G903 manages to stay lightweight at just 110g. To tune the weight even further, I just pull out the removable 10g weights from the bottom. Apart from the trendy design and LightSpeed technology, it also features RGB lighting and Powerplay wireless charging support, though, the wireless charging pad comes as an addon. Instead of that, I prefer plugging it in and use it as a wired mouse in case the battery starts to die in mid-game. All these great things seal the top spot for G903 on my list. I would say Logitech G903 is clearly the best wireless gaming mouse available today. 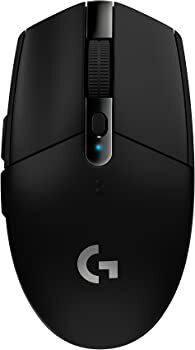 The Logitech G Pro Wireless is actually newer than the G903 and outperforms the latter in almost everything. The only reason to put it as the second best wireless gaming mouse is due to the higher price. I was kinda doubtful with the looks of it that whether it is worth the dollars it comes at. But, as a pleasant surprise, the Logitech G Pro wireless sets the performance bar even higher. 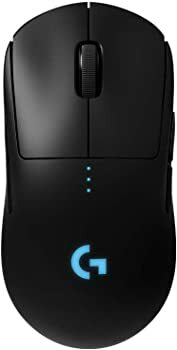 Though it does not have plenty of buttons that you would expect from a wireless mouse for gaming, G Pro focuses on the performance! It is equipped with a highly precise Hero 16K sensor that delivers ultimate accuracy and responsiveness. Playing Fortnite with this was super exciting for me and I don’t mind sacrificing a couple of extra buttons for that. Still, there’s a DPI button on the side for those sniper shots needing more precise tracking and sensitivity in your favorite FPS titles. The Logitech G Pro Wireless is one of the best wireless gaming mice I’ve used. Why? I have two solid reasons. One, the 100-16000 DPI sensor that keeps my hand and cursor perfectly in sync no matter what title I am playing. Second, the ultra-lightweight design (just 80g) which allows it to glide effortlessly. Complete with RGB lighting and ambidextrous design with removable buttons, Logitech G Pro is one great choice for any gamer who can afford it. The only wireless gaming mouse that gives strong competition to the Logitech flagship mice is the Razer Mamba Chroma. With its new ultra-precise 5G laser sensor combined with 16000 DPI, this mouse tracks even the smallest movement precisely. Though, after using the Logitech’s G Pro, I think its PWM3366 optical sensor is a little more accurate. It has a 1000Hz Ultrapolling rate which means virtually zero latency. So, you can stop worrying about your mouse lagging when you need the fastest response in your game! Razer Mamba Chroma features 9 buttons which can be reprogrammed in as many configurations with the Razer’s Synapse software. In fact, it also allows you to tweak a lot of things to match your preference for a completely personalized experience. And when I ‘personalized’, I mean it to the core. You can adjust the motion sensitivity in a just a few clicks with Synapse. The RGB lighting is fully customizable and you can match the colors to your gaming setup with Advanced Chroma configurator. Best of all, even the click force can be tweaked to anything from 45g to 95g with a handy hex wrench. Ain’t that cool? As this is a wireless gaming mouse, the batteries need recharging. And, Razer Mamba Chroma does it impressively with the special charging dock which is included with the mouse! Just put your mouse on it and it charges. Let me tell you Logitech offers a similar charging dock as an add-on for around 100 bucks. 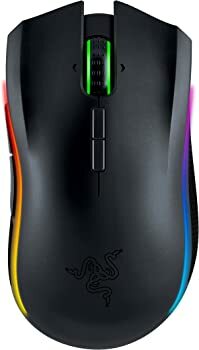 My verdict after testing it enough is that Razer Mamba Chroma is a great wireless gaming mouse with a laser sensor and RGB lighting. Logitech’s previous mice on this list are clearly not affordable for everyone. And even Logitech knows it. That’s why, with their new G305 mouse, they have tried to bring a high-end wireless gaming mouse at an affordable cost. Though its price is almost half of the top variant, there are no compromises made in the performance and design. 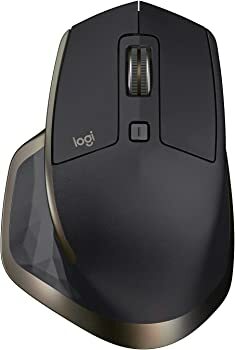 The G305 features the newest Hero optical sensor from Logitech, which is actually a 12000 DPI variant of G903’s sensor delivering almost similar tracking performance. It has got a lightning fast response time of just 1ms, that’s virtually instant. With this under your palm, your hand and pointer on the screen will be perfectly in sync! There are 6 fully programmable buttons including one right on the top for scaling the DPI on the fly. To reduce the cost, Logitech G305 has omitted the rechargeable battery system and used a single AA battery. But that’s not bad news at all, because the power management is optimized to deliver 200 hours of battery life. The AA battery goes under the removable top cover and it also sneaks in the tiny wireless dongle. To give a satisfying click, left and right-click buttons are fixed separately and not the part of the cover. If you have used any Logitech gaming mouse previously, you must have noticed a perfect ambidextrous design. Logitech G305 has the same design, so no matter you are left handed or right handed, this will work great for you. Although the scroll wheel kinda feels cheap and there’s no flashy RGB or LED lighting, still this wireless gaming mouse is far better than its wired alternative in the same range. Without a doubt, the quality and performance of the Logitech G305 make it the most affordable wireless gaming mouse for the price. Another impressive mouse from Logitech is the MX Master – an ergonomic wireless gaming mouse specially designed for right-handed gamers. The special hand-sculpt shape ensures maximum comfort and natural hand posture. With 7 well-positioned buttons – all programmable – and two scroll wheels, this one brings a lot at your fingertips. Logitech MX Master uses dual wireless connectivity options – IR and Bluetooth. What I love about this is the ability to switch between 3 devices with one touch. I use it with my MacBook Pro and Windows PC simultaneously, and it feels magic to push that button as the mouse switches from my desktop to my laptop within seconds. Though there’s a laser-grade tracking sensor, it’s not the top notch. Still, I could see a clear difference in tracking precision as compared to any of the regular mice. Also, the Darkfield tracking allows it to be used on practically any surface – transparent or glossy too – with a minimum thickness of 4mm. Those who hate the time it takes for recharging the mouse batteries, Logitech Mx Master has an answer. With just 1 minute of charging, it surprisingly works for close to 2 hours! It can also switch seamlessly between 3 different machines. All that comes at an attractive price and there’s no reason not to buy this wireless gaming mouse if you are a right-hander. The E-Blue Mazer II deserves its place in this list of best wireless gaming mouse for all the good reasons. From trendy ergonomic design to ultra-fast 3000 frames per second tracking rate, E-Blue Mazer II brings a lot of cool stuff at an inexpensive price (just around $20). At this price, it’s far better than a wired mouse. Isn’t it? E-Blue Mazer II uses the Avago 5090 gaming chipset ensuring an overall good performance with faster response and high-speed clicking. Although, I find the DPI range of 500 to 2500, a little underwhelming comparatively. The standard 2.4 GHz wireless connection and a polling rate of 250Hz ensure zero input lag or latency. It is also interference resistant that means it can receive signals even from 30 feet! Also, it can achieve a maximum acceleration of 20G. After testing it for a few hours, if you ask me, I would say the E-Blue Mazer II is one of best budget wireless gaming mouse that offers more with fewer dollars to spend. Razer’s another wireless mouse meant for gaming is sleek yet loaded with features – the Razer Lancehead! After testing it for hours, I noticed a few things with make it worth mentioning in my list. First, it is such a pleasure to hold this mouse even for long hours; thanks to precisely engineered shape and the extended rubber grips for added comfort. Second, the pro-gaming design with RGB. I absolutely love syncing it with Razer Synapse and it seamlessly blends with my gaming setup. It adds so well to the aesthetics that it will impress all your gaming buddies when they come over! A little let-down here is the Laser sensor which is not one of the top-notch options in terms of accuracy. Though its 5G Laser sensor has 16000 DPI and 200 IPS tracking, but the DPI adjustments can be done in steps of 1000 DPI while other competitors have it as low as 50 DPI providing better accuracy. Programming the mouse is very simple using Synapse including setting up the all-important lighting scheme, and the mouse pad calibration capability is nice to have if you’re into that sort of thing. Razer promises 24 hours of gaming out of a single battery charge, but while I tested, the battery power lasted around 16 hours. Hope that’s not the case with you. An interesting feature that I liked is the onboard and cloud storage capability. It allows you to save your button configurations and DPI profiles right on the mouse chipset or cloud and you can switch between the profiles even when the mouse is not connected to Synapse. If comfort and design is your priority along with satisfactory performance, you can have the Razer Lancehead on your list while buying a wireless gaming mouse. As I mentioned earlier, the whole debate of wired vs wireless gaming mouse is as old as the release of the very first wireless mouse in 1991 from Logitech. Though there’s no clear winner among them, below are my thoughts about the wired vs wireless mouse for gaming in the nutshell. Reduced lags and Slowdowns Cheaper ones may lag occasionally. In simple words, wired gaming mice are the ones which are connected to the PC via fixed cables while the wireless gaming mice come with an Infrared or Bluetooth receiver to operate wirelessly. But there’s more to it when gaming is concerned. For gaming, there are two very important things that can make it or break for a mouse – responsiveness, and freedom of movement. As the wired connection is more stable, it is clear that they are more responsive as well. So, a wired gaming mouse does not have any kind of latency or input lag during the gameplay. On the other hand, the wireless connection may lag to a minor extent subject to the quality of the transmitter/receiver and the interference. With a good wireless gaming mouse such as Logitech G903, this input lag is indistinguishable and operates just like a normal wired mouse. Also, wireless gaming mice are dependent on batteries for power which either need recharging or replacing increasing the overall cost. While the wired alternative does not have any such requirements. 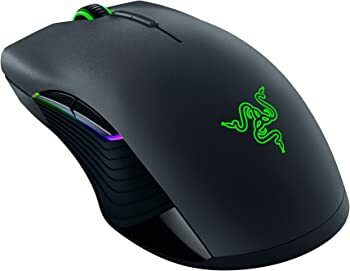 Gamers are switching to wireless mice in the modern era of gaming as they give more freedom of usage and can be moved around conveniently while the old wired mice give a very restricted usage area. 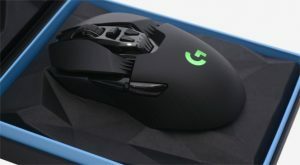 However, some gamers still do not want to invest in a wireless gaming mouse with the doubt that it may lag or disconnect during those important gaming sessions. Believe me, I have been using the Logitech G903 for a year now and never faced any lag even once! Many gamers ask me questions about using wireless gaming mice. So, in this section, I have answered some of the common ones from them. I am sure most of your doubts about wireless gaming mouse will be gone after reading this. Here you go! Is a Wireless mouse good for gaming? Nowadays, wireless mice are a good choice for gaming. You get more space to move your mouse around as well as the ability to use your mouse even at a distance. And, thanks to faster IR receivers and better batteries that ensure a lag-free and uninterrupted gaming experience. Do Wireless Mice Have Lag? No, not all wireless mice lag; only the cheaper ones do to some extent. That’s because they compromise the quality of IR receiver which results in lags and slowdown. With a good gaming mouse, even if there is some input lag or latency (which most wireless gaming products have), it is not noticeable enough to disturb you while gaming. Are you buying a wireless gaming mouse for the very first time and have no idea what things to watch out for? Well, don’t worry. To make sure you are choosing the right wireless gaming mouse, always consider the following things before making your choice. Be it a racing game or an FPS game, every split second matter! And wireless gaming mice were infamous for being slow, but not anymore. The credit goes to technological improvements due to which the response time has come down to few milliseconds. If you want to experience lag-free gaming, go for a wireless gaming mouse with the least possible response time. To enjoy supreme speed, make sure the mouse uses a 2.4GHz wireless connection as well. A wireless gaming mouse with least response time will ensure you’re always a step ahead in the game! The sensor is responsible for the tracking accuracy of the mouse. Optical sensor and Laser sensor are two common types of sensors which you will find on any wireless gaming mouse. Optical sensors provide better accuracy and tracking which is required in FPS games. A good optical sensor with 10,000+ DPI works the best for a wireless gaming mouse. 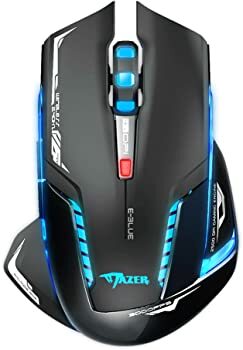 For more info, you can also refer to one of my recent post about the difference between optical and laser mouse for gaming. DPI basically defines how far the pointer on the screen will move corresponding the movement of the mouse. Having the ability to adjust the DPI on the fly allows tweaking your mouse behavior as per the situation without having to pause the game ever! My suggestion would be to go for a wireless gaming mouse that has a wide range of DPI and ability to switch the DPI in one click. By the way, all mice that I have mentioned have adjustable DPI (just telling you!). During those long gaming sessions, you would not want a mouse as heavy as a stone in your hand. It’s tiring as well as obstructs high-speed movement when needed. Go with a wireless gaming mouse that’s lightweight if do not want the game and go home with aching forearms! Getting a wireless mouse for gaming means batteries – may be rechargeable ones, maybe not – so battery life is critical. Make sure the mouse you are getting has a battery life of 24 to 36 hours on a single charge. In case of non-rechargeable batteries, go with some solid Li-ion or Alkaline batteries to avoid dying in the middle of the game. See, there are wireless gaming mice worth hundreds of dollars out there in the market. And, they are not worth it unless you are a professional gamer and ready to splurge all your money. As a regular gamer, you can get a decent wireless gaming mouse under $50 with low response rates and what not! Which Wireless Gaming Mouse is best? Actually, all the mice I mentioned have a number of great features, so choosing one can be a little unfair to others. Still, to give you my recommendation based on hours of hands-on testing, I have zeroed down to a few options. For the gamers, who want a great value for their money, the Logitech G903 is the overall best wireless gaming mouse. 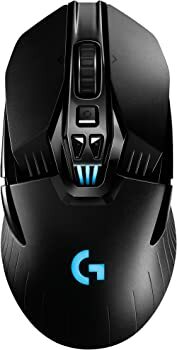 On the other hand, if you are looking for something affordable, the Logitech G305 is the best mid-range wireless gaming mouse. One more mouse that deserves an honorable mention is the E-Blue Mazer II – the best wireless gaming mouse for $20. Well, that’s all. Did I miss something? Have any query or suggestions? Share your views in the comments section below. If you found this post helpful, please share it with your friends. Also, give your rating – it encourages me to keep bringing you the great stuff from the gaming world.